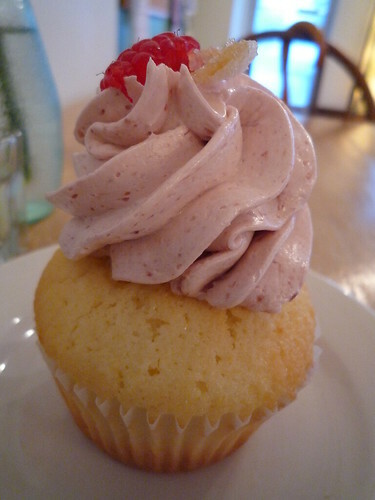 This is a guest review of Daisy Cupcakery and Café, Madison, WI by Carly Schuna. 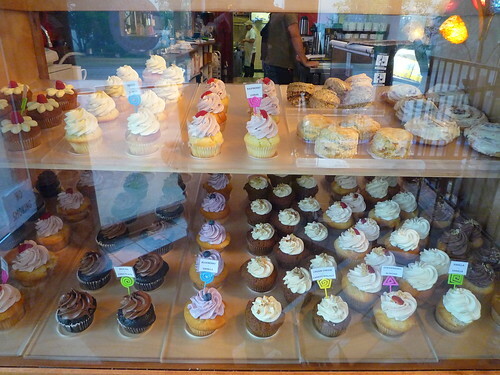 The Daisy Cupcakery opened a few months ago in Madison, and being new to town and a passionate lover of cupcakes, I decided to check it out. The inside is gorgeous—it's a huge room with roomy wooden tables and wooden chairs like you might find in a relative's house. Daisy serves breakfast, lunch, and coffee in addition to cupcakes, and I've heard those options are all good, but dude, I'm here for the cupcakes. They hit you with them right when you walk in the door—nice strategy. As I understand it, they used to just make an assortment of "regular" flavors, but now they've added vegan cupcakes and "deluxe" cupcakes to the menu. 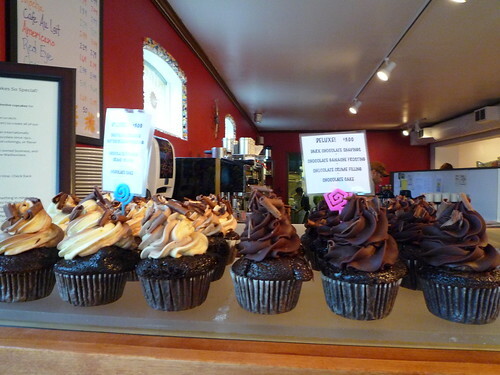 The "deluxe" flavors include mouthfuls like "Chocolate-Caramel Cake with Dark-Chocolate Ganache Frosting and Caramel Drizzle" and "Chocolate-Chocolate-Chocolate-Chocolate." Pretty beautiful. It's funny to me how they pipe frosting vertically on the cupcakes so that they're tall but you can still see so much of the cake underneath. 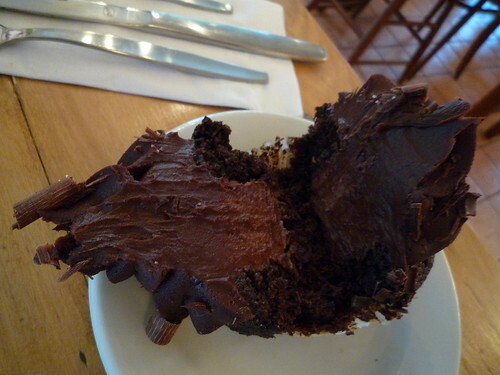 I prefer full coverage in terms of frosting on my cupcake. But that's an aesthetic detail. What really matters is the taste . . . The lemon/raspberry was a tad disappointing. The cake tasted like lemon pound cake, which isn't bad, but I was hoping for a lighter and fluffier texture and more flavor. The frosting was good. I think they might use Swiss buttercream, since it wasn't overly sweet, didn't crust, and had a nice, smooth consistency. I do wish the raspberry taste had been stronger. The fresh raspberry on top was a nice touch. This cupcake was GOOD, as in "holy crap, I should have bought 10 of these" good or "I need to break into the kitchen during the night to steal this recipe" good. The cake itself was not extra special but did have a richness to it that was very nice. 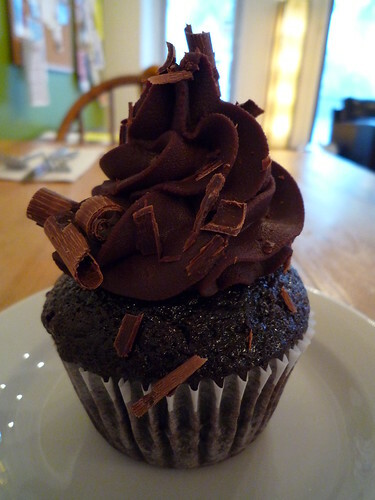 The ganache in the cupcake was incredible, and the frosting was smooth and lovely. 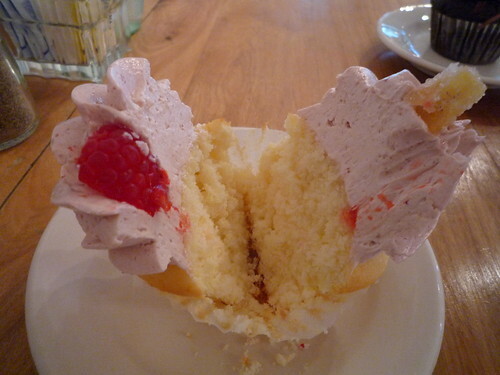 If I had a bottomless stomach, I would like to eat this cupcake approximately every five minutes. So that's Daisy! 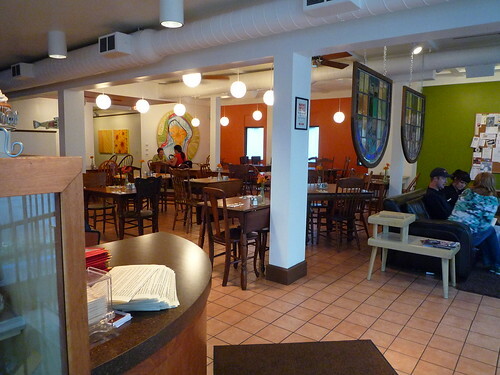 Thumbs-up overall, but the regulars are forgettable, so if you go, remember to spring for the deluxe. Mmmmmm . . . This post was contributed by Carly Schuna, who writes about Halloween costumes over at StarCostumes.com.